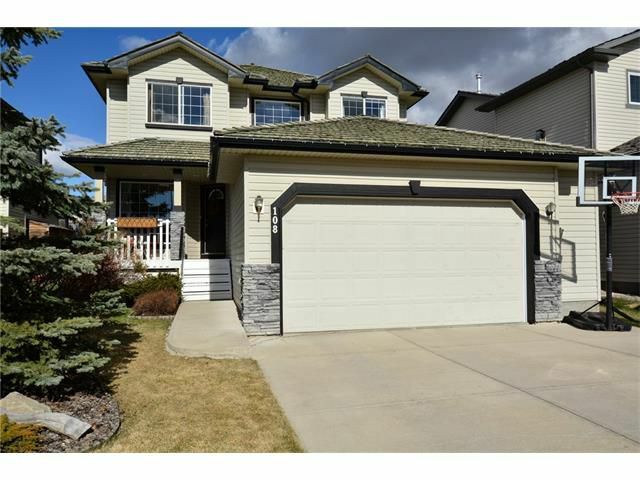 Welcome to this great family home at 108 Gleneagles Terrace in scenic Cochrane! Backing onto a park / playground, you can watch the kids play right from the kitchen window! There are so many great features in this home: tile & tiger wood floors on the main, enclosed sunroom off the spacious island kitchen, large family rm w/ fireplace & mantle, upper floor laundry, main floor den, huge master w/ walk-in closet & 5 pce ensuite including corner jetted tub, 2 add'l large bedrooms, newer engineered hardwood upstairs, rounded corners, fully finished down w/ office (could be 4th bedroom if window/egress is addressed) & rec rm with Vermont Castings gas stove, large yard w/ kids play/treehouse, tons of storage, great views, oversized garage & wide driveway, all on a quiet street that is just steps to a school bus stop! Immaculately cared for and maintained, fenced and landscaped, and ready to move into. Make sure this one is at the top of your list!